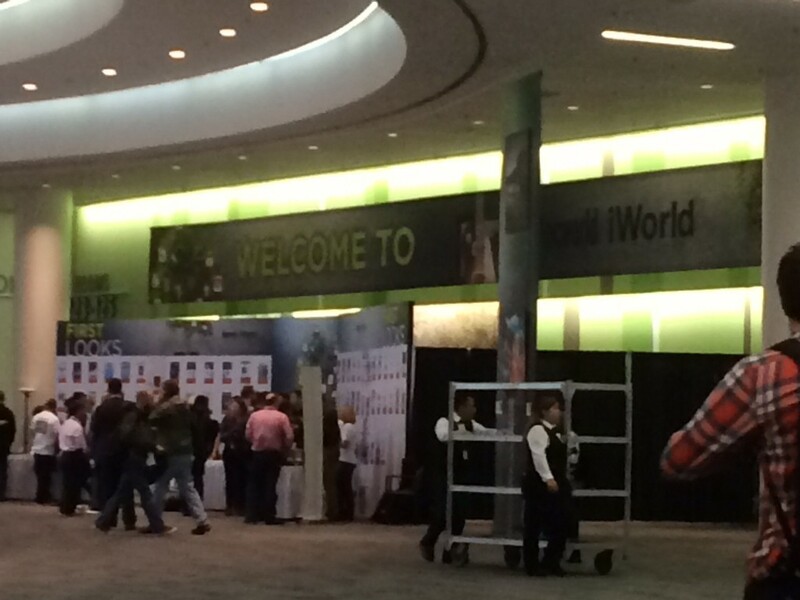 Yes Virginia, the Macworld Expo is alive and well and living at the Moscone North. Nice to be back here after a few years over at the West building. The weird thing is that this isn’t the only tech conference going on at the moment. Amazon web services is across the street at the South building and the west building has some other techy thing going on, though I didn’t see anyone at either one. So a little bit of the old and new going on. My trip here was not bad. Since they moved the conference away from the January/February timeline, I thought I wouldn’t have to deal with as much bad weather. I should say that it was my thought, not what actually happened. This has been a brutal winter on the east coast of the US so I can only imagine what it would have been like if the Expo had occurred during its usual time. There was snow both in Virginia and Ohio every day since I left home with the exception (thankfully) of my flight out from Ohio. Little bit bumpy but not bad getting out to San Francisco. Had a pleasant conversation with my Egyptian cab driver and then it was off to my hotel this year. I’ve been coming to the Macworld Expo for 8 years now and I have yet to stay at the same hotel twice. Some were nicer than others but let’s keep in mind the one motivating factor in picking a hotel. Is it cheap? This one definitely was and its exterior almost made me pass it by as it looked a bit on the scary side in the Crystal Lake/ Elm Street kinda way but so far its been pretty good. Decent WiFi, comfortable bed, clean bathroom. Lots of homeless in the area though with all the joy and good times that kind of situation brings. Walking to the Expo can be described as going through the Gauntlet of Despair. Fortunately I’m on the big and tall side, so they generally leave me alone except to ask for a cigarette. OH, I should mention that for you smokers, San Francisco is a decidedly unfriendly place. Can’t smoke in hotels (OK I can live with that), can’t smoke in the hotel parking lot (really? ), and the new ordinance that says you can’t smoke within 25 feet of any entrance…anywhere. You can relieve yourself in public (and many do), but second hand smoke I guess will kill you faster than all the diesel fumes from the buses. Who knew? Press registration for the Expo was really smooth this year and Parallels is one of the big sponsors with press getting the new version that includes an iOS app back to your desktop…I think. Since I’m iOS only for the third year I can’t really try it yet, but that will be a neat feature if it works as easy as their press kit says it does. I’m at the first look pavilion (the Expo doesn’t start until Thursday) and there are a couple of interesting products being shown. Nothing worth a big write up for now, but that doesn’t make them bad products, it just means I’m a lazy writer. There’s a couple of events tonight and I expect I’ll run into a few of my fellow MyMac writers/podcasters eventually as the day goes on but first I need to chase a bus and inhale its exhaust. I guess that’s safer than smoking.